I have changed the image in the right panel from the winter image from Bruunshaab to an image taken here at Foulum in the spring. 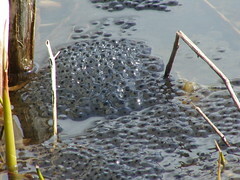 The image shows a batch of frog eggs in the pond close to our office building. I have never seen such a large concentration of eggs before. Unfortunately, the water level in the pond decreased before the tadpoles were hatched, and I am not sure how many that survived. The paper submitted to Preventive Veterinary Medicine that was described here with S.S. Nielsen as main author has now been published. S.S. Nielsen, N. Toft, E. Jørgensen, and B.M. Bibby. Bayesian mixture models for within-herd prevalence estimates of bovine paratuberculosis based on a continuous ELISA response. Preventive Veterinary Medicine , 81:290–305, 2007.